MEEKER — The annual Range Call event has a full slate of activities July 3-8, including a concert by the legendary Nitty Gritty Dirt Band. The Fourth of July starts with the Run for your Life 5K walk/run race at 6:30 a.m., and the annual pancake breakfast runs from 7-9 a.m. Both events are on the courthouse lawn. There will be an art display and auction at Fawn Creek Gallery, and art and food booths will be located at Sixth Street. The parade makes its annual trek downtown beginning at 10 a.m. After the parade there is a barbecue lunch and free live music on the courthouse lawn. There will also be a watermelon eating contest that is sure to be a a lot of fun. The ranch rodeo kicks off at 4 p.m. Friday and a host of children’s events take place during the ranch rodeo. The legendary Nitty Gritty Dirt Band headlines the evening’s concert. The event begins at 7 p.m. at the fairgrounds. Independence Day fireworks light up the evening after the Dirt Band finishes and before Triple Nickel entertains at the barn dance. On Saturday, July 5, the day kicks off with a three-on-three basketball tourney from 7 a.m. to noon at the elementary school. 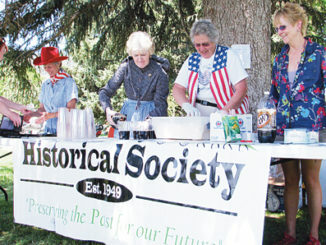 The Masonic Lodge hosts a pancake breakfast from 8-10 a.m., and arts and food booths are open on Sixth Street from 9 a.m. to 3 p.m. 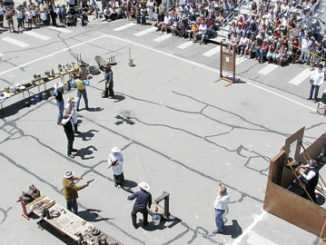 The reenactment of the historic bank robbery is at 10 a.m. at the corner of Sixth and Main streets followed by an ice cream social on the courthouse lawn at 11 a.m. Bring your lawn chairs and stay on the grounds for live music from Mainline from 11 a.m. to 2 p.m. The CPRA rodeo is at 6 p.m. at the fairgrounds and the Meeker Drill Team performs that evening as well. Rock Creek Road Band headlines the evening’s barn dance that runs from 9 p.m. to 1 a.m. The events wind up Sunday, July 6 with CPRA slack beginning at 9 a.m. at the fairgrounds and then CPRA slack and Meeker Drill Team are at the fairgrounds again at 3 p.m.
Make your plans early to attend the historic Range Call. For more information, contact the Meeker Chamber of Commerce at (970) 878-5510 or visit www.rangecall.com.